Established in 2007, Purple Frog Group are student estate agents and property managers. Providing student accommodation across Birmingham, Bristol and Nottingham, the business was founded by Greg White and Patrick Garratt – two University of Birmingham students who believed that the quality of homes and overall experience received by students could be vastly improved. Today, the company employs 40 people and works on an ethos of providing a service completely based around student needs. The company needed a better means of communicating with the student population. Working with a young demographic, Purple Frog understood that students do not check emails regularly, leading to certain urgent emails (such as notifications of changes of viewing times, or contact information for any property maintenance issues) not being seen in time. The business needed better readability and open rates for these vital messages. Textlocal enabled Purple Frog to create and send automated SMS reminders chasing paperwork, rent reminders, sending viewing notifications and emergency contact information. When appropriate, the texts had reply features for tenants to simply respond to yes-or-no questions. Purple Frog also used SMS for marketing purposes, using text message alerts to send students properties which they may be interested in, with students often changing houses each academic year. Not only did the company see far better open and response rates, but their customers’ journey was also enhanced. The response to the change in method was overwhelmingly positive – after finding that students were uncomfortable with phone calls, the ability for them to reply to questions quickly and easily via SMS was preferred. 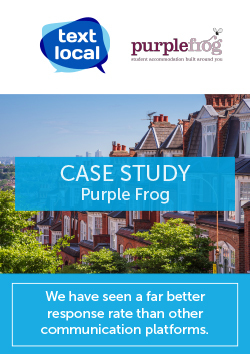 This means that Purple Frog received any necessary information from their tenants quicker, and students felt more at ease communicating with the company, leading to improved relationships.